Its origins date back to the days of Chamberlain and “Clyde,” but David Stern’s dress code policy has ushered in a new era of NBA style. That fashion should play such a significant part in the NBA rite of passage isn’t surprising given the sartorial splendor on display by the league’s veterans, but it’s interesting to look back at how this fashion transformation came to be such a mainstay. In fact, it’s probably time to send David Stern a thank-you card. In 2005, former NBA Commissioner Stern was fed up with players arriving to games, sitting on the bench, or attending NBA-sponsored events wearing baggy and/or garishly-logoed or colored clothing, ‘do rags, and the like. At the time, much ink was spilled over Stern’s not-so-veiled assault upon so-called “thuggish” attire when he instituted a controversial leaguewide dress code that essentially decreed that during the season, players would dress like they were going to work: business casual (slacks, dress shirts, no sneakers) or full business attire (suit and tie). From then on, players would be expected to leave the pendants, medallions, or huge chains at home, too. The backlash was immediate, loud and predictable, with players branding the policy as racist and merely a symbolic Band-Aid for the league’s (and society’s) deeper problems. Stern, however, refused to back down, and the dress code became something of a fashion revolution for the league. Dwyane Wade of the Miami Heat even credits Stern with upping his personal fashion game. Of course, long before Stern put the kibosh on dressing down, there were lots of players who always made sure to look “casket sharp,” as my grandmother used to say. The July 1999 launch of CODE Magazine was a call-to-arms for men of color who felt overlooked by more mainstream fashion publications like GQ and Esquire. 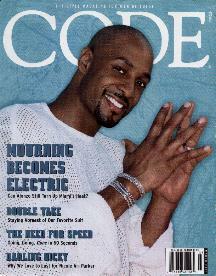 Hall of Famer Alonzo Mourning even once graced the cover of CODE, as did Ray Allen. Before Mourning, there was Wilt Chamberlain, Pete Maravich, and Walt Frazier; all of whom were renowned throughout the league for their standout style. The heirs to the couture throne have eagerly taken up the mantle in the wake of Stern’s decree; indeed, being a first-round draft pick tends to be replete with fashion spread nowadays. Russell Westbrook of the Oklahoma City Thunder is a staple at New York Fashion Week — he’s even on cheek-kissing terms with iconic Vogue editor Anna Wintour — and he’s parlayed his fashion chops into his own clothing line at Barney’s New York and a line of sunglasses. Earlier this year, he was also named Marketing Creative Director for True Religion Jeans. Chris Bosh has partnered with upscale accessories brand Armstrong & Wilson to produce and market his own line of ties. His teammate (for now) Wade helms his line with The Tie Bar. Chandler Parsons, a part-time model when he’s not suited up for the Dallas Mavericks, has a whimsical line of socks with Stance (with whom Wade also has a sock line). Kevin Durant, LeBron James, Carmelo Anthony, Chris Paul, and Kobe Bryant are all routinely included in current NBA best-dressed discussions. Stephen Curry, 2015 league MVP and captain of the 2015 NBA Champion Golden State Warriors, has been anointed the men’s clothing brand ambassador for Express. John Wall endorses Sean John menswear. Tony Parker has an endorsement deal with Tissot watches. All across the league, brands are recognizing that associations with stars can generate a real return on marketing investment. Not everyone is into fashion just for fashion’s sake, though. Joakim Noah tapped his mother, sculptor Cecilia Rodhe, to create custom necklaces for his “Rock Your Drop” campaign run through his nonprofit foundation, Noah’s ARC. Noah actually won the league’s 2015 J. Walter Kennedy Citizenship Award for outstanding community service, too. Predictably, the NBA is capitalizing on the explosion of interest in player fashion. The 2015 All-Star Game saw the inception of All-Stars participating in their own fashion contest — this year’s inaugural winner was J.R. Smith of the Cleveland Cavaliers. The league is also partnering with Westbrook to create team-themed glasses. During this year’s Draft, 12-year-old business mogul and Shark Tank winner Moziah Bridges, founder of the successful Memphis-based Mo’s Bows, was tapped by ESPN between picks to give his opinion on that evening’s fashion hits and misses. ICYMI: his burn of Jalen Rose’s 1994 draft day suit was epic. Upscale fashion also happens to be a way for the league’s oft-overlooked female fanbase — the group reportedly comprises some 40 percent of the NBA’s faithful — to connect with their favorite players. Fashion endorsements are obviously big business for players, too; a way to plan for and enhance life after retirement, and a vehicle for expression that can create lasting and lucrative revenue streams. In the end, the NBA’s fashion revolution has had a cultural impact that goes beyond the refreshing metamorphosis from the uber testosterone-fueled product endorsement images of yesteryear. Nowadays, it’s no longer just about the swoosh; we’ve entered an area of style where only the bold survive — and thrive.